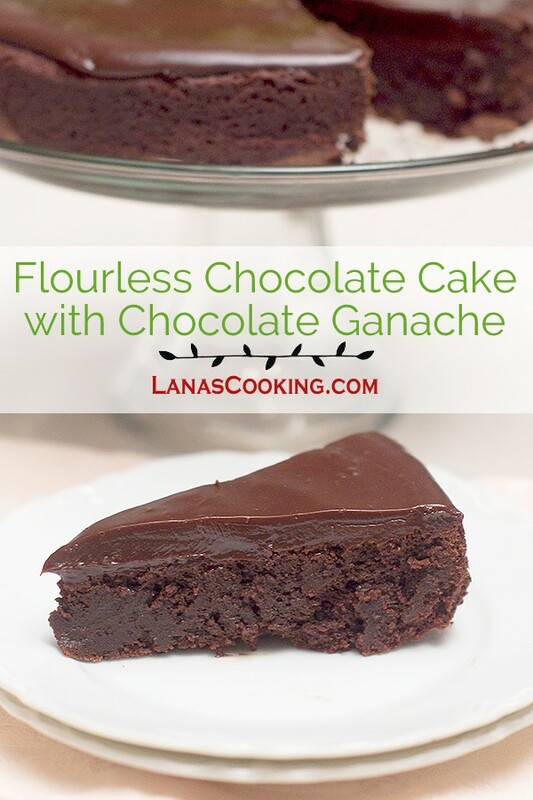 If you’d like to make something extra special for a true chocolate lover, then this Flourless Chocolate Cake with Chocolate Ganache is the perfect recipe for you to try. This is an unabashedly decadent, rich, delightful chocolate cake. And it’s flourless! Can you believe it? Now, if you’ve never had a flourless cake before, you may be surprised that it doesn’t look like a traditional cake. That’s because there’s no leavening in the recipe and, therefore, nothing (except the eggs) to give it any rise. It also deflates some as it cools, but that’s normal. The layer has loads of chocolate chips and butter and cocoa powder making it so delicious. And if that isn’t enough, it’s topped with a silky ganache of more chocolate and heavy cream. To say that this is rich is an understatement. Even though this is only an 8″ cake, because of its richness, it easily serves 12. You may add a little dollop of softly whipped cream if you like, but I generally serve it as is – especially when I’m serving real chocolate lovers! 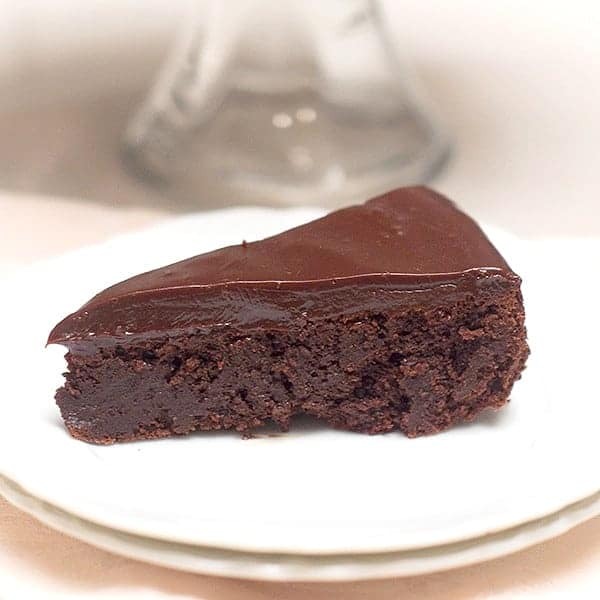 Besides being just about the perfect chocolate dessert, it’s really quick and easy to make. You don’t even have to get out a mixer! Preheat the oven to 375 degrees. Grease an 8” round cake pan. Cut a circle of wax paper to fit bottom of the pan. Insert the wax paper and grease it as well. Place 1 cup of the chocolate chips and the butter in a medium sized microwave-safe bowl. Microwave in 30 second increments, stirring after every 30 seconds, until the butter is melted. 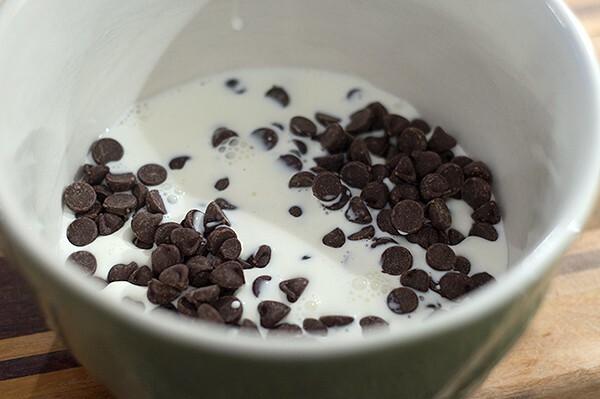 Stir until the chocolate chips melt and combine with the butter. Stir in the sugar, salt, coffee, and vanilla. 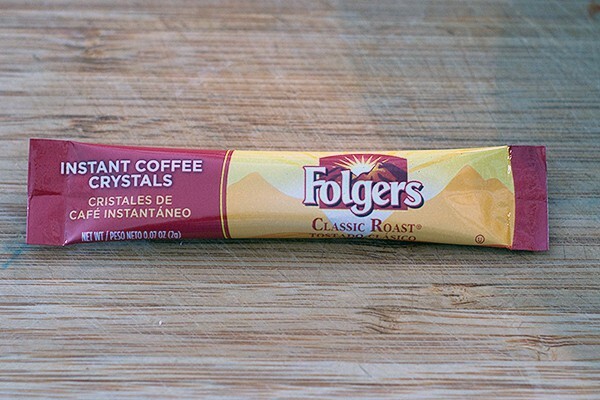 A note about the coffee – I used one .07 ounce packet of instant coffee crystals in this recipe. The packets come five to a box for just about $1 and keep really well on the shelf. One packet is a teaspoon of instant coffee. If you want a more pronounced mocha flavor in your cake, you could use two packets but I think one is just perfect. Switch to a whisk and whisk in the eggs until the mixture is smooth. 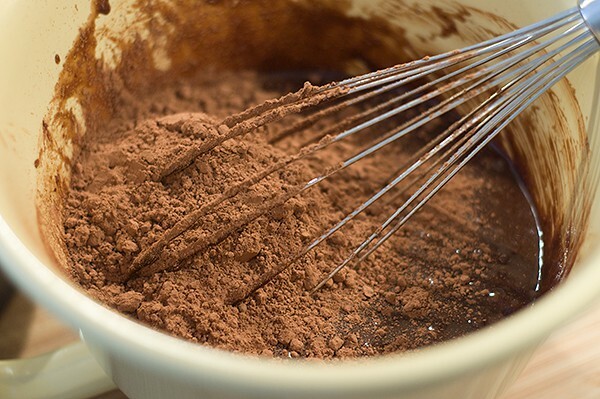 Add the cocoa powder and whisk again just until combined. Spoon the batter into the pan. Bake for 25 minutes. The top will form a thin crust. Remove from the oven and cool in the pan for 5 minutes. 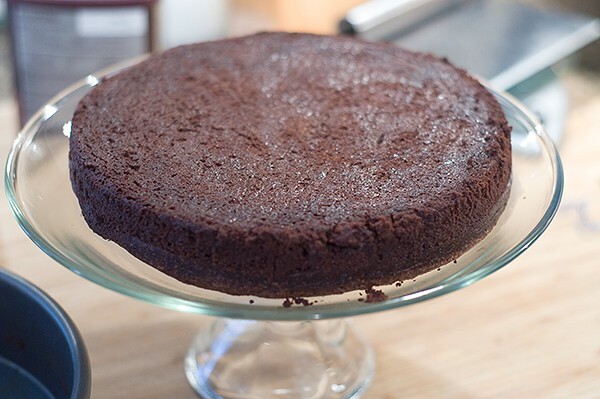 Loosen the edges of the cake from the pan with a sharp, thin knife. Invert onto a serving plate (note: the edges may crackle a bit). Allow the cake to cool completely before proceeding. 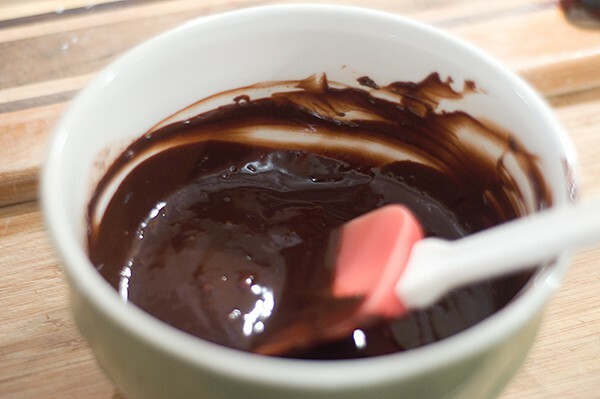 To make the ganache, combine the remaining 1 cup chocolate chips and heavy whipping cream in a microwave-safe bowl. Heat until the cream is hot but not bubbling. Stir until the chocolate chips melt and the mixture is very smooth. Pour the ganache over the top of the cake, spreading just to the edges. 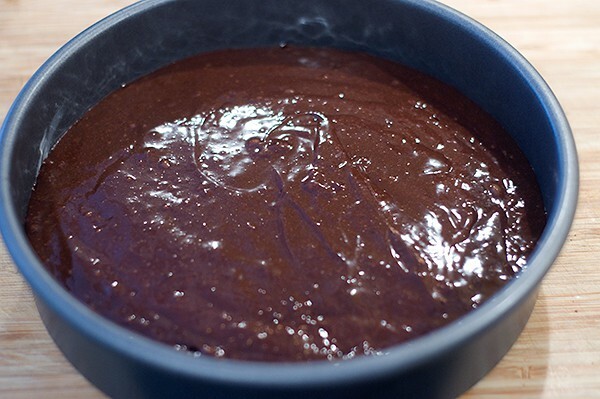 Allow the ganache to set for several hours (refrigerated or not) until ready to serve. Grease an 8” round cake pan. Cut a circle of wax paper to fit bottom of the pan. Insert the wax paper and grease it as well. 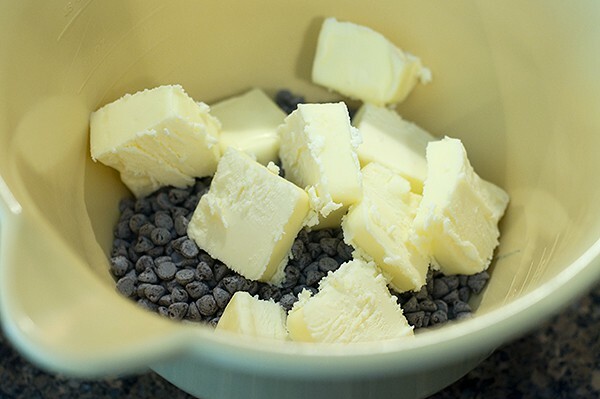 Place 1 cup of the chocolate chips and the butter in a medium sized microwave-safe bowl. Microwave in 30 second increments, stirring after every 30 seconds, until the butter is melted. Stir until the chocolate chips melt and combine with the butter. Switch to a whisk and whisk in the eggs until the mixture is smooth. 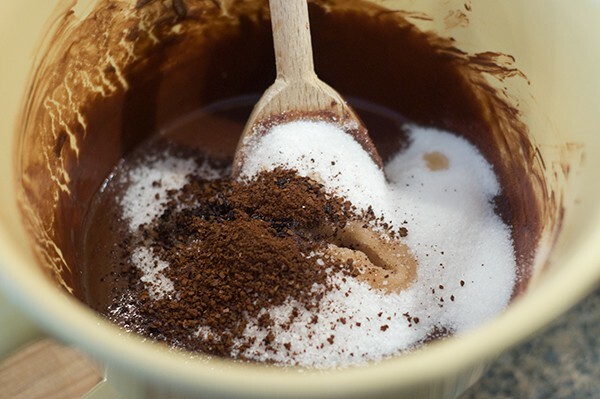 Add the cocoa powder and whisk just until combined. Make the ganache – combine the remaining 1 cup chocolate chips and heavy whipping cream in a microwave-safe bowl. Heat until the cream is hot but not bubbling. Stir until the chocolate chips melt and the mixture is very smooth. Pour the ganache over the top of the cake, spreading just to the edges. 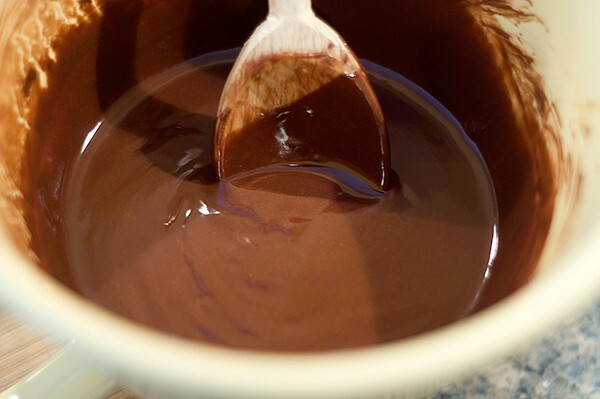 Allow the ganache to set for several hours (refrigerated or not) until ready to serve. Adapted from King Arthur Flour web site. Wow! That looks AMAZING!! I may have to break out the mixer! Lana, I was just reading a “tip” from one of the big food mags the other day saying not to attempt ganache with chocolate chips because it won’t turn out right because of the ingredient added to the chocolate to make the chips hold their shape. I said “Bah humbug” because I’ve done it many times! And your scrumptious looking photos prove that there is nothing wrong with the texture of this ganache! Wow. Well, I’ve made ganache many, many times and always use chocolate chips. No problem at all as you can see from the photos above! What did they say you should use instead? I totally agree with you! Bah humbug. I want to dig my fork right in!